This easy English muffin bread recipe has all of those nooks and crannies and craters of an English muffin but in a quick, no-knead toasting bread loaf. It’s a fragrant batter bread with that distinct yeasty flavor that we all love. Instructions for bread machine and stand mixer included. You can let it rise overnight in the refrigerator if you want to save time in the morning or if you prefer to develop the flavor more. Updated from the original post published in 2011.
Who Doesn’t Love English Muffins? I think that the best thing about English muffins is the way that butter and honey melts and pools in the craters.In fact I have been known (I’m sure you won’t be surprised) to put so much butter and honey on my English muffin that it overflows and oozes down the sides in a warm, buttery, sweet-sticky river. That’s the best. I have never been fussy about what variety or flavor the English muffins were — I love them all from sourdough to whole wheat. Even though I have tried and tried to get them exactly right at home I just can’t do it but that’s OK. With this recipe for an English muffin bread loaf I can have that perfect texture and flavor anytime and it doesn’t take forever, either. It’s a batter bread which makes this a super easy recipe. No kneading, no mess, and you can have it hot and steaming out of the oven in less than 90 minutes. 90 short minutes to English muffin nirvana. Don’t cave to the temptation to slice it and eat it hot, though. Cool the toasting bread at least part way and then be sure to toast it. It will be better that way. (say it with me…)… ENLISH MUFFIN!!! 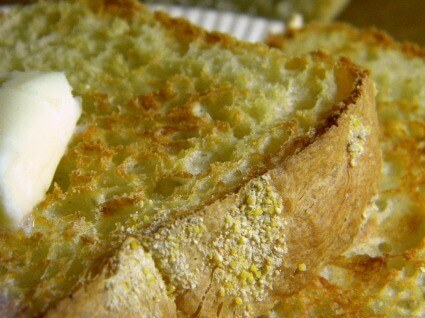 I promise you this toasting bread will come out perfectly and the flavor will be amazing. You can make two large loaves of English muffin bread with this recipe or you can double it and make four. I’d double it if I were you — it tends to disappear quickly and you can freeze it if you need to. Use coarsely ground cornmeal to dust the pans. It will give you that flavor and slight texture that the conventional English muffins have. If you don’t have any cornmeal you can just dust the pan with flour instead. Not a big deal but not as good either. Mmmmm…. look at that crust. So, seriously… what do you like best on your English muffins? My favorite is butter and honey, hands down. LOTS of butter and honey. Don’t cave to the temptation to slice it and eat it hot, though. Cool the toasting bread at least part way and then be sure to toast it. It will be better that way. 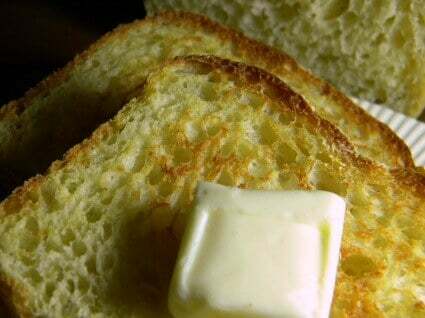 This toasting bread is so easy I really think most people will have a great amount of success making it as directed but if you MUST make it in a bread machine here’s how. Put all of the ingredients in your bread machine. Program the machine for basic white bread. If you have a crust setting go for the lightest crust. Check the dough halfway through the second kneading cycle. It should be soft and a little sticky. If it isn’t then add a little water or flour — but only if you absolutely have to. Just before the final rise remove the dough and roll it in cornmeal then place it back in the machine to rise and bake. This batter bread is so easy to make you really don’t knead (knead = need – see what I did there?) a mixer. Some people just prefer to use one though so I thought I’d add instructions for doing so. Here’s the deal… If you choose to use a mixer to make this the nooks and crannies that give it the wonderful English Muffin bread texture will not develop as well. It will likely come out similar in texture to a heavy sandwich bread. Warm the bowl with hot water then dump the water out. Add the yeast to the bottom of the bowl. Add the honey and warm water. Let proof for 5 minutes. Add the rest of the ingredients except the cornmeal and mix with the paddle attachment. Let the batter bread rise and bake according to instructions in recipe. You can also get the paperback version of my book on Amazon Bread Bootcamp. Please leave a review? It really helps! You’ll find more great products for your bread baking adventures in the Restless Chipotle & Co. Storefront! Here’s that English Muffin Bread Recipe!! By the way, if you like making easy batter bread like this one try the whole wheat beer bread recipe! I think you’ll love it. If you enjoy this recipe please consider giving it a 5 star rating! I don’t think freezing would work with a batter bread – I think it would deflate but I’ve never tried. Can I use my hand mixer for this recipe or is a stand mixer strictly recommended? I’m so excited to try this; I plan to do make-ahead breakfast sammiches with it to go in my freezer! I think it would be too thick for a hand mixer unless it was a very powerful one. I thought a stand mixer was NOT recommended? It’s not.But some people still want to do it that way. Will make someday, but was wondering: Can I make muffins instead of the bread. Muffins freeze better then bread. I’ve never tried but I am sure you could.